Congratulations to Hasan Anter: Event #56 Champion ($777,928)! We played an unscheduled Day 4 today due to another massive field of 3,389 players that entered Event #56. With such a large prizepool and so much money at stake, it was well worth it to Hasan Anter who not only came out victorious, but did it in rare and stylish form. We began Day 3 with 42 players but eliminated all but three competitors. Gavin Smith (12th), Bryan Paris (11th) and Bryn Kenney (10th) all finished just outside the official final table. James Boyle and Ryan Goindoo exited the final table first as both of them failed to win a race to save their tournament life. Then it was Anter run good time. His eliminated Rayan Nathan, just before he cracked the of John Horvatich with all in preflop. Just after John Borzio was eliminated, Anter busted Selim Oulmekki when his held against Oulmekki's on a board to end the night. Hasan Anter had over half the chips in the tournament at the beginning of play today and his heater picked right back up where it left off. He was able to make fours full of eights on the river to cripple Andy Philachack and immediately grabbed the momentum. It was just a few hands later that Philachack's didn't hold up against the of Nemer Haddad. This set up a fantastic heads up battle between Haddad and Anter. Anter began the match with approximately a three to one chip lead and despite winning the first major pot of heads up play found himself almost dead even in chips after just a dozen or so hands. Luckily, he was able to take charge again to take a strong lead before doubling Haddad up when his couldn't get there agains the of Haddad. However, Anter's relentless aggression heads up eventually paid huge divideds. It wasn't long before he retook the chip lead by forcing Haddad off a hand by moving all in on a board. A few hands later, he took back full control when he forced Haddad off another large pot. This caused Haddad to get short enough that he had to three-bet shove with . While essentially flipping against the of Anter, he found himself in a lot of trouble on the flop. The turn ended things and officially gave the 56th gold bracelet awarded at the 2011 World Series of Poker to Hasan Anter. However, the magic of Anter wasn't over. The dealer put down the meaningless river which almost went unnoticed... it was the giving Anter a royal flush! To our knowledge, no other bracelet winner has taken down the tournament with a royal flush which is why we offer extra congratulations to Hasan Anter, winner of $777,928 and his very first gold bracelet! Hasan Anter raised on the button to 500,000 before Nemer Haddad reraised all in for 3.2 million. After some thought, Anter made the call and Haddad's tournament life was officially at risk. The flop came which gave Anter a flush draw. The turn wasted no time getting Anter there when it was the . While that would officially be the card that gave him the bracelet, the river gave him a Royal Flush which just put the icing on the cake. Haddad fought through a difficult final table and a swingy heads up battle but ultimately finished one spot short of the bracelet. He will take home $470,521 as a conciliation prize, still more than 300 times his initial investment! Hasan Anter raised to 400,000 on the button and Nemer Haddad defended. The flop came and Haddad checked. Anter bet 500,000 and Haddad called. The turn was the and again Haddad check-called, this time for 800,000. The river was the and Haddad checked for a third time. Anter quietly announced he was all in and Hassad hit the tank. He double checked his cards, thought for a couple of minutes and then angrily mucked his cards. On the button, Hasan Anter raised to 500,000 and Nemer Haddad called. The flop came down and Haddad check-called a bet worth 650,000. The turn was the and both players checked. The river was the and this time Haddad led for 1,650,000 before Anter moved all in. Haddad immediately asked for a count and stood up over the table to study his opponent and his chips for a couple of minutes. The dealer and tournament director both counted to the chips to be sure and determined that it was an additional 3,580,000 for Haddad to call. 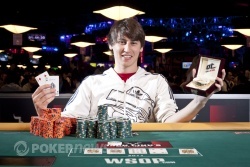 Eventually, he folded and allowed Anter to retake the chip lead. Nemer Haddad limped his button again before Hasan Anter raised to 560,000. Haddad moved all in and Anter began his tank. After a couple of minutes he decided to make the call and the hands were turned face up. The flop came and Haddad remained in front. The turn was the which gave Anter a flush draw and some extra outs to chop the pot with a straight. However, the river not only blanked with the , but it gave Haddad a set. Haddad now takes the chip lead with 9,100,000 to Anter's 6,200,000. Hasan Anter raised to 300,000 from the button and Nemer Haddad defended his big blind. The flop was and Haddad checked. Anter bet 400,000 before Haddad moved all in. Anter slouched back in his chair and seemed torn. After a little bit he threw in his cards and Hassad shipped the pot to get back to 4 million. Nemer Hassad raised to 320,000 from the button and Hasan Anter called. The flop came , Anter checked first to act and Hassad continued for 500,000. Anter check-raised to 1.3 million and Hassad let go of his hand. After that pot, Hassad is down to 3.4 million while Anter has 11.9 million. Nemer Haddad limped his button and Hasan Anter checked his option. It was checked down to the river on a when Anter bet 200,000. Haddad raised to 725,000 and Anter three-bet to 1,800,000. Haddad made the call and Anter flipped over for two pair. Haddad could only shake his head and muck as he falls to 4.2 million. Hasan Anter limped his button and Nemer Haddad checked his option. 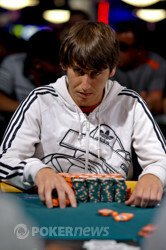 The flop was and Hassad check-raised a bet of 250,000 by Anter to 700,000. Anter made the call. The dealer was instructed to deal the turn and put down the . Hassad checked again and Anter took this opportunity to bet 1,000,000. It forced Hassad to fold and Anter retakes a strong lead in this heads up match as Hassad falls to 5,85 million. On a board of , Nemer Hassad moved all in first to act. Hasan Anter folded and fell to 11.45 million. A couple of hands later, the board read and Hassad bet all three streets. On the river his 1,400,000-chip bet was called by Anter and Hassad tabled . Anter was unable to beat it and now the two players have nearly identical stacks. On the button and as the small blind, Hasan Anter raised to 300,000 which was called by Nemer Hassad. The flop came and both players checked. The turn was the and again, both players checked. The river was the and Hassad checked a third time before Anter threw out a bet worth 500,000. Hassad called but was unable to beat the of Anter. Nemer Haddad limped his button again and Andy Philachack moved all in from the small blind. Hasan Anter got out of the way in the big blind before Haddad made the call to put Philachack at risk. The flop came out which put Haddad in the lead. Philachack would need one of the two remaining three's or runner-runner straight or flush to avoid elimination. The turn gave him some hope but the river did him in. While Philachack hits the rail, Haddad moves up to 4 million chips and enters the heads up match with a 3 to 1 chip disadvantage. Nemer Haddad limped his button, Andy Philachack folded and Hasan Anter checked his option. The flop came down and both players checked. The turn was the and Anter bet 200,000 before Haddad raised to 900,000. Anter three-bet with an all in and Haddad let go of his hand. Haddad is still second in chips but has just 2.55 million while Anter takes a commanding lead over his two opponents and has 11.2 million. Hasan Anter raised from the button to 300,000 and was called by Andy Philachack in the big blind. The flop came down and Philachack check-called a bet of 500,000. The turn was the and both players checked. The river was the and for the third time, Philachack checked. Anter announced a bet of 1,000,000 and after some thought Philachack made the call. Anter quickly tabled for a rivered full house. Philachack jumped out of his seat and paced around a bit before returning to the table to muck his cards. Philachack is down to 1.3 million while Anter hits 10.3 million chips. All three players were here, dealers were here, the lights were on and everything seemed ready to go. Except it wasn't. We're not sure why exactly but the chips have just arrived and play will likely get under way shortly. With just three players left, Event #56 was stopped yesterday after the end of the 30th level. While all around us the opening days of the Main Event are occuring, three men went to bed last night with a lot more on their mind than making a Day 2. Hasan Anter, Nemer Haddad, and Andy Philachack have an immediate shot at glory sitting right in front of them. 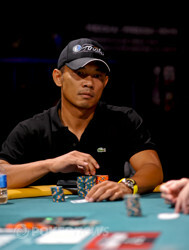 Anter leads the way on Day 4 with 8,385,000 chips. That accounts for over half of all the chips in play. 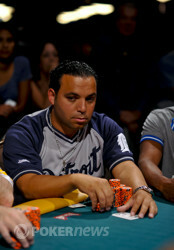 Nemer Haddad holds a slight edge for second place with 3,440,000 over the 3,235,000-chip stack of Andy Philachack. There are still over 100 big blinds on the table among the three competitors so there is still enough play in the tournament for any of these three gentleman to win. Action is set to kick off here in just a few short moments so be sure to stack around as PokerNews will have all of the action covered.